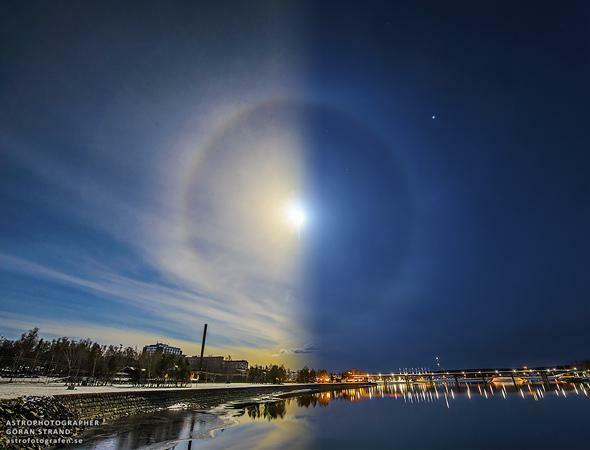 Sun Moon halo: Göran Strand photo splits the sky. One ring to rule the sky. Click to enannulenate. Sometimes, what you see in the sky is all about alignment. Two different alignments of vastly different scale came into play for photographer Göran Strand, who lives in Östersund, Sweden. 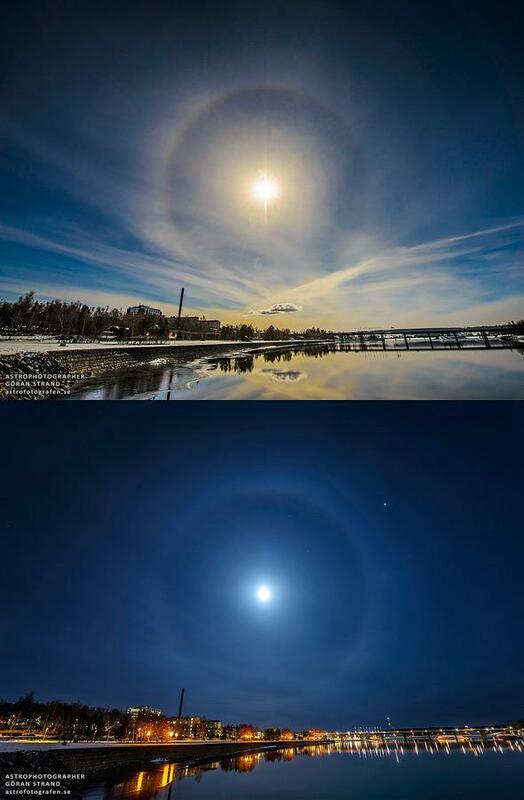 He took the photo above, showing an atmospheric phenomenon called a 22° halo. The left half of the picture shows a halo around the Sun, taken at 10:21 UTC on April 1. Then, just over 10 hours later he took the second shot, when there was a halo around the Moon. The very, very cool thing about this: The Sun and Moon were very nearly in the same exact position in the sky when he took both shots! That’s actually pretty rare. The daily path of the Sun across the sky (called its diurnal motion) depends on your latitude and the time of year. In the summer it travels higher up, and in the winter lower. On top of that, if you live at high latitude the Sun doesn’t get as high at a given time of year as it does for people at lower latitudes. The Moon orbits the Earth on a path that’s tilted to the Sun by about 5° (roughly the width of your middle three fingers held at arm’s length). That means the Moon usually follows a different path across the sky than the Sun, moving much lower or higher. Here are the two shots shown separately. The bright “star” to the upper right in the Moon photo is Jupiter. But not always. As the Earth moves around the Sun, the tilted orbit of the Moon means sometimes it passes very near the Sun in the sky. If that happens at new or full Moon, we get an eclipse (solar or lunar, respectively). I know this can be hard to picture; happily I made a Crash Course Astronomy video explaining all this. The point is, near the time of an eclipse the Moon and Sun must be traveling along the same path in the sky as the Earth turns. And guess what? April 1, when Strand took those shots, was 11 days after a solar eclipse, and three days before a lunar one! That’s why the Moon and Sun were so close to traveling the same path, allowing him to take this phenomenal shot. Haloes form when long hexagonal ice crystals are in the air, usually a few kilometers up in cirrus or cirrostratus clouds. Light gets refracted (bent) inside the crystals, and the geometry dictates that crystals about 22° away from the Sun (or Moon) bend the light toward you. That’s why you see a circle in the sky around the Sun—there are crystals all over the place, but only those at the right distance send the sunlight back toward you. That’s the second alignment! The Sun and the crystals have to be aligned with you in order for you to see the halo. As it happened, conditions in Östersund stayed stable for long enough that Strand was able to see haloes many hours apart. I don’t like to use the word “magic” because in popular vernacular it’s the antithesis of science. But in this case I think “magical” applies. At its heart, this phenomenon is all science, mathematics, geometry, physics. But in our hearts, well. Poetry and metaphor fit there as well. Magical.